The focus of our journey through Germany was the Christmas markets, but serendipity brought us to amazing surprises that we could have never planned. To me, that’s the joy of traveling, and staying open to adventures along the way opens the door for spontaneous fun and rich experiences! 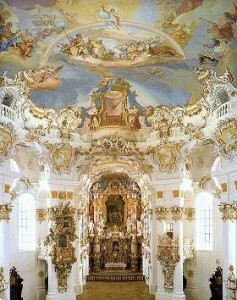 One of our scheduled stops was a grand rococo style cathedral, The Wies, located essentially on a farm in the middle of Bavarian nowhere. The story of the church is one of legend and lore, but it’s presence in the remote and rural countryside is an enigma of contrasts. Many pilgrims visit the church, but that snowy day we were all alone. Our awe at the beauty of the structure and setting was of itself amazing, but we were equally inspired by the time we shared at the inn/home of the local caretaker. They spoke no English, but graciously served us a simple meal in the quaintest of settings: rustic furnishings, a roaring fire in the hearth, German Christmas music playing on a vintage radio, and snow falling outdoors. It couldn’t have been more Norman Rockwell! Lots of “bergs” in Germany, so on to the others we visited- Rothenberg, Nuremberg, and Bamberg. 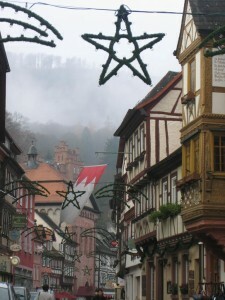 Rothenberg ob der Tauber is to me the home of German Christmas. 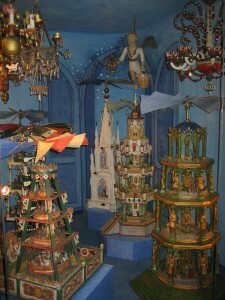 There is an actual Christmas Museum there, which I could have spent days at. 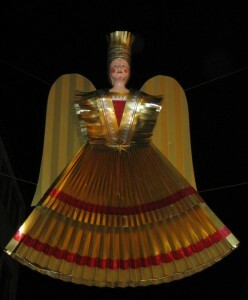 The town center is pedestrian, and at night a guided tour by a local watchman reenacts yesterday’s tales, and is the inspiration for an actual nutcracker. 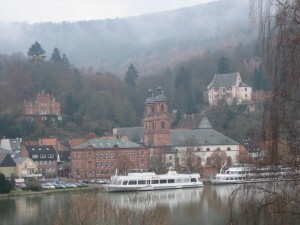 The whole town is picture perfect, and so clean and pristine you almost can’t believe much dates to the medieval period. Of such historical importance, it was agreed that this town would not be bombed in WWII, and has been mostly spared through the centuries. It’s no less than captivating! 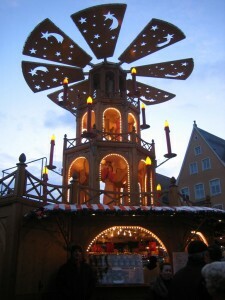 Nuremberg has it’s own claim to fame during the holiday season. It is famous for the small, idyllic paper angles created there. A outdoor children’s play captured our attention, as did it’s large area of market stalls. The noteworthy WWII museum speaks to how the events may be avoided in the future, and was a refreshing message of hope. Last but not least we visited Bamberg. We had hosted a high school student from there a couple of years before, and his parents graciously led us on a enlightening tour. It’s pedestrian center is beautifully scenic with a river weaving through Bavarian gingerbread buildings with red tiled roofs, creating a scene I can vividly picture still today. The market in most towns had a commemorative mug created especially for that year, and hot spiced wine or cider was served along with foot long skinny sausage sandwiches. We collected a mug from each place we visited, and I use them each Christmas season to remind us of our adventure. The end of our trip was punctuated by an amazing evening in Munich around the clock tower plaza, with a choir singing carols in German, light snow falling, and a market bustling with holiday revelry. The perfect ending to a perfect trip!